Update: now you have the possibility to specify your own admin colour scheme leaving the layout exactly like it is in WordPress 2.5 by default. 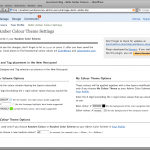 Matt Mullenweg recently asked if anybody has taken advantage of the new admin colour scheme switcher in WordPress 2.5, and the short answer is yes and no. There is the Fluency theme by Dean J. Robinson, which is more like a complete redesign of the administration panel. to use one of the administration themes which slightly alter/improve the positioning of different administration panel elements, like the main navigation, dashboard information and the plugin listing. There are eight basic colour options available or you can specify your own base colours by choosing ‘My Colour Theme’, or use the random colour generator. 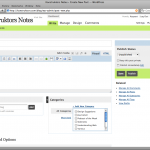 to place Tag and Category selection in two columns right after the text editor in the ‘Write Post’ panel. This option can be enabled for every admin theme, including the default ones. Baltic Amber admin themes also improve the scanability of the Plugin Management screen by replacing the darker background colour for the activated plugins with a green ribbon on the side. Download from WordPress Extend. 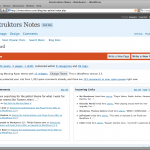 Compatible with WordPress 2.5 only. Activate the plugin at the Plugin Management section under ‘Plugins’ menu. Go to your User Profile (under ‘Users’ > ‘Your Profile’ or by clicking on your name at the top right corner of the administration panel). Choose either Random Color scheme or My Color scheme, or one of the admin themes that you would like to use in the Admin Color Scheme section and click ‘Update Profile’. 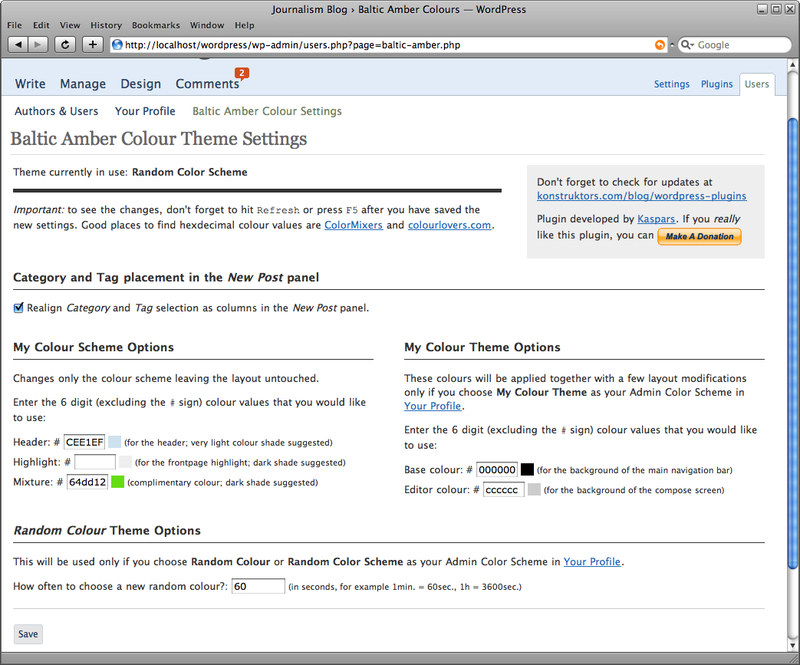 If you decide to use either the Random Colour or the My Colour theme, configuration options are available under ‘User’ > ‘Baltic Amber Colour Settings’. 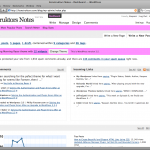 Random color and My color schemes work as fine as the default WordPress color schemes. Modified Admin themes work perfectly in Firefox 2 (and above), IE 6, IE 7, Opera 9 and also Safari. Please leave them in the comments. If something is not working like expected or you find a bug, please remember to mention the browsers (name and version) that you are using. I’ve uploaded the baltic-amber file to the wp-contents/plugins folder, but the plug-in doesn’t appear on the plug-ins page, so I can’t activate it. Any suggestions? Wolfie, did you unzip it before uploading? All the plugin files should be inside the baltic-amber directory. 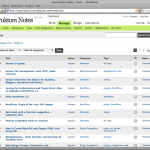 On the server it would look like this: /wp-content/plugins/baltic-amber/ with all the plugin files inside this directory. Is this how it looks on your server? Also, are you using WordPress 2.5? Yes, I unzipped it. Yes, I’m using 2.5. Yes, the directory tree looks as it should. No, it doesn’t list as a plug in that I can activate. Wolfie, could you please make sure the access permission for the baltic-amber directory and all the files inside it is set to 755. The folder was 755 but all the files inside were 600. This is strange, I’ve never had to change the permissions on plug-in files before. Anyway, changing the files to 755 seems to have solved the problem. Thanks for your help. Wolfie, great that you got it working! Those permissions usually depend on your server configuration and also on the FTP software. Ronald Huereca from the Reader Appreciation Project suggested this solution. Having authored many popular plugins, he must have heard a lot about the different problems people have had with getting things to work on different server configurations. 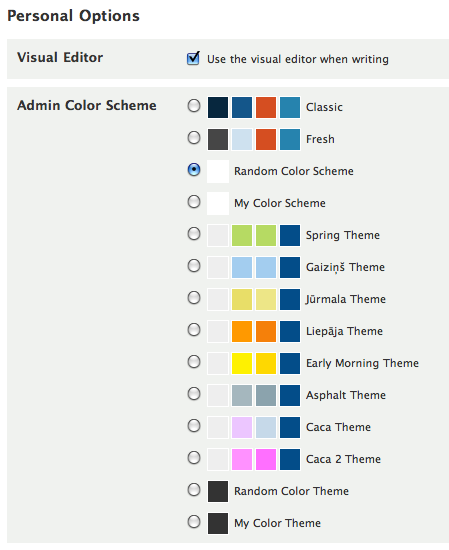 Hey Kaspars, thanks for being one of the first out of the gate to release a set of color schemes for the admin panel. Kudos for doing that and it looks like you did a good job. This could be nice plugin one day. I’d like to suggest the option of turning the realignment off, just leaving color-scheme changes. Not just because it doesn’t look corrertly in Opera (my primary browser) and IE7. Good luck. 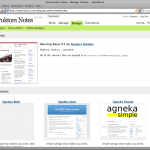 Great plugin Kaspars. I’m using Jūrmala and it feels really nice. I think your solution of moving the categories selector also works really well. That’s a great plugin! I have finally admin area of my colors. Great plugin! Similar to the comment a few above me, if the color scheme and the realignment of the Write Post page could be be separate, that would be awesome. That way I can use “Fresh” with the realignment. Andrew and Jan, I am really happy that you have found it useful! 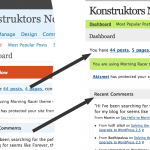 kohi, do you mean the positioning of categories and tags in the New Post panel? I could easily do that. Please don’t promote these as color schemes as they make layout changes, which is too bad. Nice color schemes. I’ll second kohi’s request for the option to change colors ONLY. That includes the movement of the Dashboard/Write/Manage/etc tabs. I prefer them where they are by default. Matt, no problem, I’ll change the name. Would Admin Themes be ok, or do you have other suggestions? I just noticed the encryption in the php file. Why the encryption? What’s in there that needed to be obscured? Thanks for the update, let me know if you do a colors-only version and I’ll link it up. I have made an update: now you have the option to use the realigned category and tag positioning in the ‘Write Post’ section also with the default WordPress themes Fresh and Classic. It is a simple on/off switch under the ‘Baltic Amber Colour Options’ which you can use with any of the themes. I have also changed all the mentions of ‘colour schemes’ with ‘admin themes’ as the plugin actually changes the positioning of a few interface elements. Please see the screenshots to know what chages you can expect. p.s. I made this plugin for my own use, and mainly to implement those tiny layout changes, which, in my opinion, are small improvements. You can try it out and see if it works also for you, if not, you can always revert back to the default themes. It’s a nice plugin, but… why putting the settings page as a users submenu and not as a settings submenu?. Samuel, these are per user options, so I put them where the user options are. I know that most plugin options are available under settings, but ‘User Theme’ is more appropriate under ‘User’ tab I think. Loving it so much. Thank you for releasing this for the admin panel! :) It makes writing out posts so much more enjoyable with 2.5! p/s: Column all fixed now! Thanks! 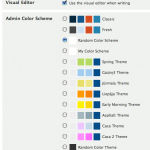 I’m loving the color packs that come with the wp2.5 admin, tbanks for adding the feature to align tags and categories! Matt, Kevin Paquet, Matt Algren and kahi, I have updated the plugin to inlude the ability to change only the color scheme, leaving the layout just like it is in WordPress 2.5 by default. You can either create your own colour scheme (by specifying three base colours) or use the random colour scheme generator. To make it work, I had to go through the whole colors-fresh.css file and group all the elements that share the same colours, and filter out also the gray colour elements. Now there is an array that lists all the colours that have to be replaced, together with the mathematical rules on how the colours should be derived from those three one specifies in the settings page. Theoretically this can be expanded to any number of colors which are all mixed from only a few base colours. 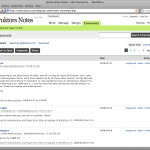 Please, include it into WordPress Extras repository for updates tracking! Thx! The plugin doesn’t work for me. I can not change any theme on the users page. All other settings on the same page can be changed. I can not even change to “classic”. The only thing that works is the change of tag/category. Daniel, could you please take a screenshot of ‘Your Profile’ page where the list of themes is and post it somewhere online. Update. It must be some problem with my blog because on same server and same database I have another blogs in which it works perfectly. Not really, Daniel. Are you sharing the same database among these two installations of WordPress? I honestly don’t have a single idea what might be the problem. believe me, I have compared with my other blog in which it works and it looks as it should. Daniel, it could be related with “Easy admin color themes” plugin, but at the same time my plugin doesn’t use any of the core CSS files, only those supplied with the plugin, therefore I really doubt it. Could you please check if the permissions for the baltic-amber directory and all the files inside it are set to 755. This is same as for the file in the blog in which it works. Daniel, could you please get the numeric values of the permissions, by right-clicking on the directory and individual files and selecting ‘file attributes’ (or something like that). Try looking at the differences between those two WP installations. I really don’t have any other ideas. I see, thanks anyway. I am going to check with the other plugin that crashed before. I am pretty sure that is what caused this. Difference in installations are someplugins: adsense manager, all in one SEO pack, google reader widget, google xml sitemaps, multipage toolkit. Other than that I cn not see any major difference. Good news everybody, I have got those colour themes (not schemes) working 100% correct in IE6, IE7 and also Opera. Hurray! I encountered two issues installing & using this plugin. Anirudh Sanjeev’s OneClick Installer 0.9.8 plugin did not unzip the plugin properly to the wp-plugins directory. It did not create the baltic-amber subdirectory, but rather unzipped the files as baltic-amber\filename in the wp-plugins directory. Second problem was when using one of the new color schemes, it messed up the menus created by Andy Staines’ admin-menus 2.5.3 plugin. It worked OK with the Classic or Fresh color scheme. Meggva, thank you for the comment. Regarding the OneClick Installer — Baltic Amber download file is the most regular .zip file, so I don’t really have any ideas why this plugin is failing to unzip it. I will try the OneClick Installer myself and see if there are any problems. Maybe thats the IZArch archiver that I use which is doing the strange things to the file. Regarding the Admin Drop Down Menus — it has its own two CSS stylesheets which are applied according to the colour scheme you have selected (either Spring or Classic). It wouldn’t work with any other color scheme either (only with standard two), because it uses its own HTML for the menu, which has to be styled according to the overall color scheme. Edit: I thought that Admin Drop Down Menus is the Lighter Menus plugin. I’ll try it out and will see if problem can be solved. In case of plugins like those two or this one, it is important to understand that they are all trying to work nicely with the default WordPress settings, and all the possible plugin combinations are not been tested. Therefore thank you for reporting all the problems you encounter. I strongly recomend not to use the OneClick Installer as, depending on your server configuration, it may create files and directories with permissions which your regular FTP user is not able to change, so you are unable to delete the files, and also the plugin can not delete the files it has created. The only solution for the file permission problem I mentioned in a comment above was to use SSH and delete those files from a command-line. Rev. Voodoo, thanks for the comment. 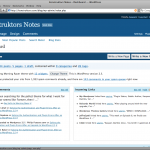 Are you using the latest 0.5 version of the plugin? I just tried editing and saving those settings and it all worked fine. Could someone else please confirm if you have it working or is there a bug in the plugin. Also, do you see the ‘Options saved’ message at the top of the screen when you click ‘Save’? Regarding the dark colors — currently that is impossible. Are you using the custom theme (like Spring, Jūrmala, etc.) 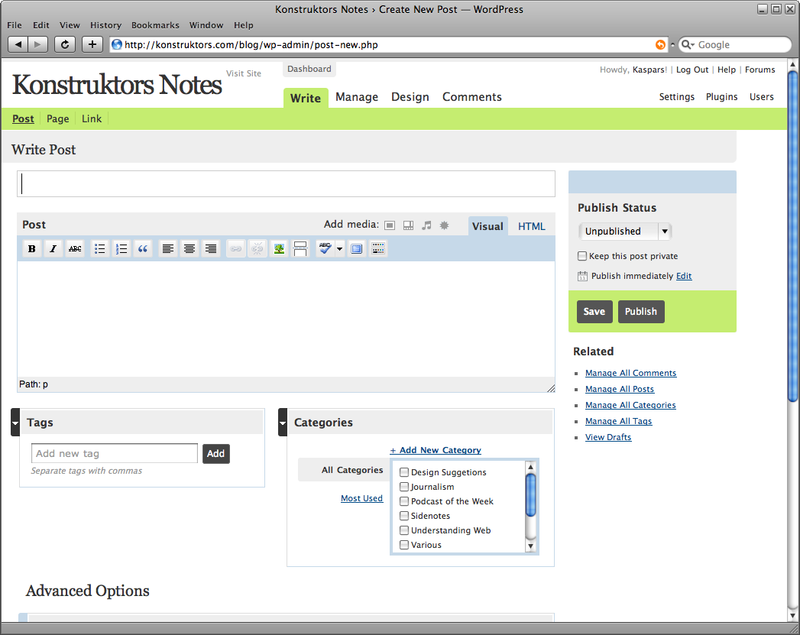 or the default WordPress theme with the ‘My Color’ option enabled? To get the dark colors work, I would also have to go through the ‘Classic’ color scheme and sort those colors in order to get the idea of what can be replaced. If you look at the sorted ‘Fresh’ scheme file (which I made for this plugin): http://konstruktors.com/blog/wp-content/plugins/baltic-amber/konstruktors.css and the original http://konstruktors.com/blog/wp-admin/css/colors-fresh.css, you get the idea of the work involved :) If someone can do that, I could incorporate that in the plugin. Update: I have added a few extra lines of CSS to help the admin-menu plugin work nicely with Amber Themes. If you require this functionality, please update the plugin. I am also working on a fix for the Lighter Admin Drop-Down Menus plugin, but it might be a bit harder to get it working. p.s. Yesterday I submitted the application for including the Amber Themes plugin in WP Exted for easier updating, but haven’t been approved yet. Turns out that fixing Lighter Admin Drop-Down Menus is impossible due to the fact that it overwrites the CSS of #adminmenu identifier (used for Write, Manage, Design…) without adding any new indentifiers in order to indicate that this plugin has taken over the adminmenu. Therefore I suggest you simply use the Admin Drop Down Menus instead. Richie, which browser are you using? I just tested the ‘Remove max-width’ plugin and it works like a charm on all themes. Update: Also the other plugin you mentioned works perfectly in Firefox 2 and 3. 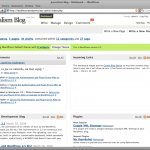 Works great en IE6 IE6 and Opera, only I have issues in my older version of Firefox. Nice Plugin! Thanks for getting back to me. Lets see if I can answer all the questions for ya. I do not see the options saved dialogue at the top of the screen because when I click on the save button, nothing happens at all. My page makes no attempt to reload or anything. I am using the newest version (as of 4am) of the plug in. I think you updated it again, I’ll check and update. I tried using my colour choices using custom and default themes. The random theme, and all the other themes work. Just not the save button on the settings page. I can type in my colour choices, or type in time length for random option, but either way nothing happens when I click save. Thanks again for tryin to help! Ah. You can disregard my previous comments now. I’m part way there. I just upgraded to 0.6 (the third iteration I’ve used). The first 2 did not work for me, however this one does, the save button now recocnizes being clicked on. So that is very nice! Now I’m not getting the color choices I input as my actual colours, so I’ll have to experiment. I’m using the colour scheme options, and trying to use shades of red (#990000 and variants) but it comes up sea green. Are all colours available? Or do I have a limited choice? Voodoo, have you enabled either ‘My Color Scheme’ (for default WordPress layout) or ‘My Color Theme’ for my modified version of the layout? Did you refresh the page after submitting the new colour values? Try hitting F5 on the keyboard. Ah. No more problems. I did referesh the browser and set everything up properly. It appears that my work computers are just goofy. When I got home from work this morning, everything looked just how I wanted it. Thanks for the input, and nice plugin! Just wanted to let you know that even with version 0.8 my problem remained. But when I added a new test user I noticed it was possible to change theme for that user. I then made a new user and deleted mu old one, then created a new user with my original name and now the problem is solved. I have no idea though what was the problem with my orginal user but if someone have the same problem you know how to solve it. Well, I just upgraded to 0.8 and unfortunately that broke what I had going. 0.6 worked perfectly for me. When I upgraded my colours are not displayed at all. On the color selection screen the little boxes show the correct colours that I choose, but whether I choose My Color Scheme or My Color theme, all I get now is white or grey. Rev. Voodoo, I sent you an email yesterday. Hey, James, thanks for the kind words. Yours is not bad either! thanks, nice idea. activating the realignment of tags & categories only causes some strange rendering on the latter, though. Marco, which browser are you using? If it is IE6 it might not look very good on screens with less than 1024 pixels in width. 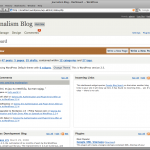 Pingback: Temas para o painel de controle do WordPress | BlogueIsso! Hey Kaspars! I found you via your post at the ThemeShaper Forums. You’re a class act! I’ll be trying out your admin themes & plugins, and reading what you have to say. Thanks! I installed this plug-in using the One Click Installer and now have found it has created problems so I’ve tried to uninstall but as you probably know, I can’t uninstall. But I can’t find where you mentioned using SSH or how to uninstall. Could you please help? I’d like to reinstall it properly but can’t do so until I get the corrupted files removed. I am not sure what happened but the admin menu bar is at the top almost in the middle and everything else is at the bottom, I can hardly see anything as well. 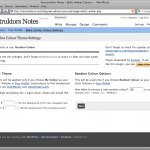 After I activated the plugin I selected a theme that shows 2 color boxes side by side and clicked save. 755 permissions and baltic-amber/baltic-amber.php is basically the setup. Anthony, this plugin works only with WordPress 2.5. Is this the version you are currently using? It is very old. OK, Above where the download link is, you have it is for 2.5 or greater. I am on 2.7.1 MU. I guess that is a type error? Anthony, yes — it is a typo. This plugin works only with 2.5.